Two major milestones are on the horizon for Ichiro Suzuki. An additional 134 hits would tie him with Pete Rose at 4,256 professional base hits. If he gets 22 hits beyond that, he would then reach the 3,000 hit threshold in MLB. An incredible accomplishment given that he spent his first 9 seasons in Japan before coming to the Major Leagues in 2001. As fans, when we think of hitting, we are used to thinking about at bats [AB’s], but plate appearances [PA’s] is the more precise way to measure, since it includes walks and sacrifices which don’t count as AB’s. 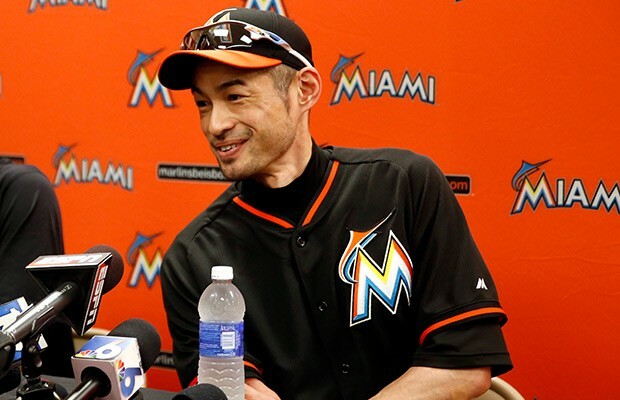 Barry Jackson has reported that while Ichiro’s base contract with the Marlins is for $2 million, it could increase up to $4.8 million based on additional PA’s. The bonuses start kicking in at 300 PA’s in increments of 50 up to 600. So barring a major injury, which Ichiro has avoided throughout his 23-year professional career, getting enough PA’s is all that stands between him and international professional baseball history happening in Little Havana. In my informal review of how local bloggers have weighed-in on the subject, Joe Frisaro and Michael Jong’s article as of March 2015, both estimated 340 PA’s. Interestingly, in a Jan 2015 article before the Ichiro signing, Jong was much more pessimistic about Ichiro’s expected PA’s. But how did they get to 340 PA’s? While Jong is very detailed in his use of analytics, he did not not specify his assumptions on getting to 340. Frisaro added up the PA’s by the 6 Marlins bench players used as pinch-hitters or reserved outfielders last year. As such, Frisaro’s 340 strikes me as too generous, whereas January Jong too stingy in allowing that Ichiro might only match Reed Johnson. There is a consensus that Ichiro will not be platooned and will not play first base. So his role will be as the first pinch-hitter off the bench and a typical 4th outfielder, playing in case of injury or spotting starters a day off. Further, given that Yelich is a Gold Glove winner and Ozuna and Stanton are considered above-average defensively, it is unlikely that Ichiro will be used extensively as a defensive replacement. That’s it. Even Snider’s 359 PA’s are a bit of an outlier, since he began the year as a starting outfielder. It will be that close. While Ichiro is a famously classy guy, I wouldn’t blame Christian, Marcell & Giancarlo for always walking behind him. As a sign of respect of course. This entry was posted in Miami Marlins & MLB and tagged Barry Jackson, Christian Yelich, Giancarlo Stanton, Ichiro Suzuki, Joe Frisaro, Marcell Ozuna, Michael Jong. Bookmark the permalink.